Being a responsible person you would choose an insurance plan that can give you some return at the end of the policy. The amount you invested can give your family a financial protection your family needs at the time of your untimely demise. 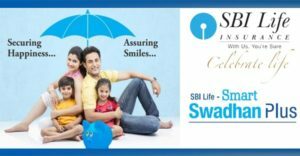 SBI Life Smart Swadhan Plus is an individual, non-participation, non-linked term assurance with return of premium plan, to meet your need for insurance with an advantage of getting your money back after maturity. This plan offers a twin benefit of life insurance along with 100% return of investment i.e. 10% return of premium paid till date in a lump sum amount. SBI Life Smart Swadhan Plus Plan comes with maturity benefits provided to the policyholder at the time of maturity of the policy. All the premium amount during the policy tenure will be paid in the lump sum amount on the survival of the policyholder. Higher of Basic Sum assured or 1.25 times of single premium or maturity benefit will be provided for the Single Premium Policy. Single premium term can be surrendered at any time of the policy. For LPPT and RP the policy can be surrender after 2 years of premium paid for LPPT-5 and for LPPT-10&15 and RP plans at least 3 years. The policy provides tax benefit as well under the income tax law. The policy provides tax exemption under section 10 D of the income tax law. You will get a free lookup period of 15-30 days will be provided. If you are not satisfied with the policy, you can return the policy and your full money will be refunded by deducting the documentation charges. A lapsed policy can be revived within 2 years from the day of first unpaid premium provided that all the premium due till date will be paid. If the life assurer commits suicide within one year from the date of commencement of risk, 80% of premium paid is payable. If the life assured commits suicide within one year from the date of revival of the policy, 80% of premium paid is payable to the nominee.